U.S. Marshals Service First Issued badge (known as the " IKE" badge). 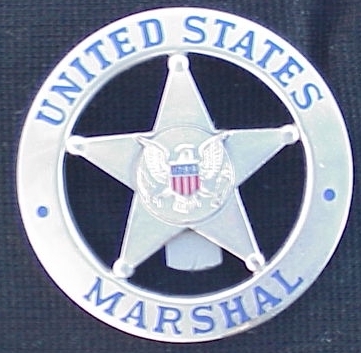 Two of these style badges was issued in 1941., the United States Marshal badge (three quarters size ) and Deputy United States Marshal (full size). The Chief Deputy United States Marshal badge was not issued until January 1951. The control number and credential warning are on the back of the badge. Badges were of gold color (some are marked 1/10 of 10KT. on the back). Made by the Robins Company (Robins CO. was bought by V. H. Blackinton CO.) Badges were bought by the U.S. Department of Justice. They had control over the Marshals accountable property at that time. On the U.S. Marshals badge the number on the the back was the District number, Arizona was 008, Colorado was 013, Wyoming 091, and so forth. Each District has a signed number, 1 thru 100, but not all numbers are in use then or today. 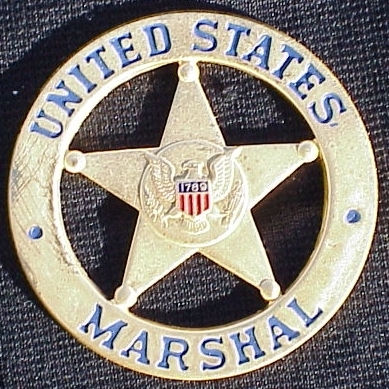 Third issue United States Marshals Service Badge. This badge comes in two colors. 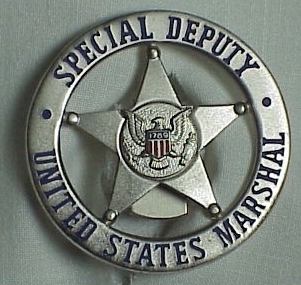 The gold ones that are issued to the United States Marshals (95 of them) and the Directors badge. The silver badges are issued to all Operational personnel (Chiefs, Deputy, Supervisors, Inspectors, W.A.E). The gold badges are numbered 1 thru 100. The silver badges are numbered 101 thru 6000. All numbers are not issued. Badges were made by V. H. Blackinton CO. Inc. and William Anderson Badge Co.
Special Deputy United Marshals badge. They are issued by Headquarters, The badge is smaller in size. Made by V. H. Blackinton Badge Company. They are numbered on the back. The Court Security Officers were issued one on a plastic pocket holder with number on the back of the plastic. 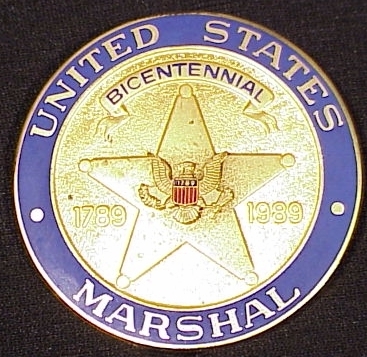 The Millennium United States Marshals Badge is issued from July 2000 to December 2001. They are worn by Operational personnel for 18 months in place of the belt badge. It is an option to wear it. The badge is a gold color. Hallmarked Blackinton.